"He likes it hot, I like it good. We compromise on jalapeno peppers." Combine goat meat, chile pepper, curry powder, garlic, salt, and black pepper in a bowl. Cover and refrigerate to allow flavors to blend, 1 hour to overnight. Remove goat meat mixture from bowl and pat dry, reserving marinade. Heat vegetable oil in a stockpot over medium-high heat. Cook meat in batches, browning on all sides, 5 to 6 minutes per batch. Transfer meat to a plate. Add onion and celery to the stockpot; cook and stir until onion begins to brown, 4 to 6 minutes. Stir browned goat meat into onion mixture. Add reserved marinade, vegetable broth, and bay leaf. Bring to a boil, cover, reduce heat to low, and simmer for 1 hour. 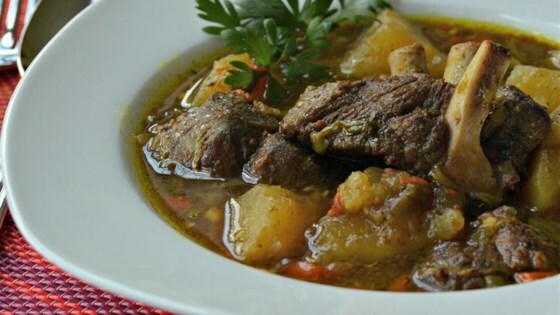 Stir in potatoes; simmer until potatoes and meat are tender, 35 to 45 minutes more. Remove stockpot from heat, skim off surface fat, and remove bay leaf. Substitute homemade stock or water for the vegetable broth, if desired. The hotter the type of chile pepper you choose, the hotter the overall dish. Lamb or pork can be substituted for the goat. We prefer to serve this with bruschetta instead of rice. We like to serve this meal with Slow Cooker Tapioca for dessert. I've never made curry before, this was delicious!